Scattered thunderstorms early, then cloudy skies after midnight. Low 53F. Winds W at 5 to 10 mph. Chance of rain 40%.. Scattered thunderstorms early, then cloudy skies after midnight. Low 53F. Winds W at 5 to 10 mph. Chance of rain 40%. 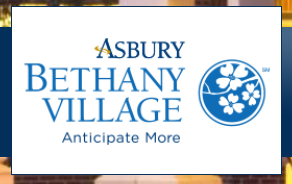 An Asbury community, Bethany Village is central Pennsylvania’s leading Continuing Care Retirement Community. With a strong commitment to building health and wellness for every resident, a comprehensive continuum of care supported by an unparalleled social environment is offered. Living options include residential living, assisted living, skilled nursing care, and memory support.